When a certain Ad Ossendrijver got to know about LA-based radio station Arrow 93 FM* [and its all classic rock format], he thought this format could be a great asset in Holland as well. Together with some Dutch big shots, Arrow Classic Rock Radio kicked off in late '96 mainly as a non-stop cable radio station. With its name switched to Arrow Rock Radio, the station has now evolved into a well-known and well respected station, which can be found on AM 675, whilst a stream is available on www.arrow.nl, making it possible for all the world to listen to those timeless rock classics. 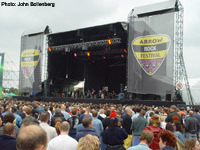 For the second time, Arrow teamed up with promotor Mojo in order to stage the Arrow Rock Festival held in Lichtenvoorde, Holland on June 12th and 13th. Sadly, due to elections taking place in Belgium on Sunday, 13th June, I was unable to attend the Saturday show. More metal oriented, with big names like Ten Years After, Y&T, Mot?rhead, Scorpions, Judas Priest, The Godz, Eric Burdon & Animals, UFO, Blue ?yster Cult and Alice Cooper on the bill, the fact that also Bad Company and my favourite rock singer Paul Rodgers would be there almost made me change my mind. Sadly it rained all day on Saturday, immediately turning the pitch into a huge puddle of mud. In the evening though a lot of hay was spread all over the land, and due to the fact that it no longer rained during the night, it meant the pitch almost dried up completely by the next day. Already at eight in the morning I found myself in front of the voting booth that Sunday morning, June 13th. Having fulfilled my duties, we all left for Lichtenvoorde, which according to the poster would be an unforgettable day for all prog fans. With Saga replacing White Lion and Fish replacing Porcupine Tree, for sure the ten acts scheduled for that day would leave us speechless! Divided over two separate stages - the main stage being in open air, whilst the smaller stage could be found inside a marquee - from the very first band onwards many thousands of music lovers were already present. On the stroke of two the loud sounds of Symphony X kicked off in the marquee. Half an hour later, on the main stage, the softer sounds of Caravan would hit the stage and I was a bit afraid that the loud Symphony X material would clash with the music on the main stage. Due to some great work behind the respective mixing desks the sound remained perfect on both stages. As I wandered all over the place that day, I only saw bits and pieces from all the artists involved, as opposed to their whole sets. Later on people informed me that indeed the sound of Symphony X was a bit on the loud side whilst after a while their set became a little predictable. It was 2:30 pm when Caravan greeted the thousands of fans who were waiting for them in front of the main stage. Their one hour was filled with some songs from the new The Unauthorised Breakfast Item CD as well as some of their alltime favourites such as "For Richard." Their set ended with a splendid rendition of "Nine Feet Underground." Backstage, all of the bandmembers seemed very pleased, as was Eclectic boss Mark Powell. As soon as I knew Caravan had been added to the poster, I wasn't sure whether this band could attract a fair amount of people, especially as they were the first band on the main stage. But as soon as I saw the many thousands of enthusiasts, I know that Caravan is still very big in Holland! Immediately after Caravan's show I had to rush to the Marquee to see Saga. If Caravan is big in Holland then Saga have to be huge, as there wasn't a single place left inside in that marquee. 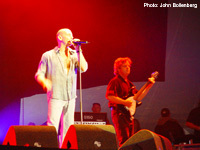 Singer Michael Sadler seemed very at ease and later on told me it was great to be playing Holland again, especially on the eve of the release of their new album Network. Back to the main stage again for some authentic West Coast rock delivered by the legendary Iron Butterfly. Of course "In-A-Gadda-Da-Vida" became their big showstopper here, whilst the atmosphere of the sixties could be found all over the field, pot included! 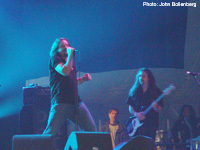 When Porcupine Tree decided to devote all of their time to record the new album and thus pull out of the festival, the organisers looked for a worthy replacement. They found it in the person of ex-Marillion singer Fish, who with a selection of solo material plus some material from his brand new album Field Of Crows managed to give a good impression. 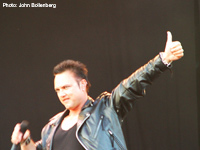 In comparison to when he had just left Marillion, for sure Fish has lost many fans, but over the years he not only established himself as a great solo artist but also as a good actor, gaining new fans all over the world. During Fish's set, to me the biggest surprise of the day started their show on the main stage. It had been fourteen years since their last European visit but Heart really surprised all of us. 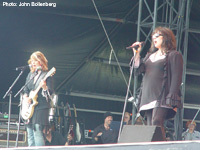 What a great band, what a myriad of fantastic songs and above all what a superb voice Ann Wilson still has! It was a joy to see Heart perform, delivering vintage classics such as "Crazy On You," "Dog And Butterfly" and "Barracuda." I also noticed a female keyboardplayer here. Splendid! 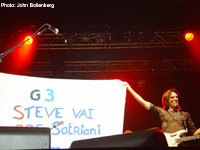 By now the Marquee was filled with Vai and Satriani fans as the Arrow Festival also meant the start of the new G3 tour. 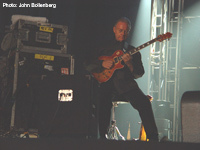 Sadly these fans were not very polite towards the third guitarist of the G3 tour, as Robert Fripp was often booed at. G3 would take up all of the marquee for no fewer than four hours, first with Robert Fripp, then with the amazing Steve Vai playing on a three neck guitar (and backed by Jeremy Colson, Tony MacAlpine, Billy Sheehan and Dave Weiner). 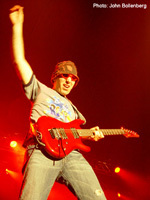 Then Joe Satriani followed by a jam including all three guitarists. 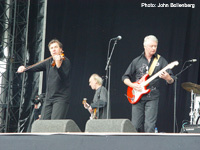 No festival in Holland should be without one of their own legends and this year the choice had to be Golden Earring. Having started out in the sixties, this wonderful band remains one of the best rock bands in the world, with a huge number of original songs to choose from. No doubt for a lot of music lovers on the pitch, they were another highlight. 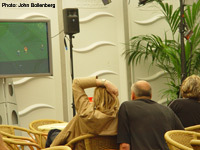 I only stayed for one song, as around that time I was backstage watching the soccer match between France and England together with Fish (who supported France! 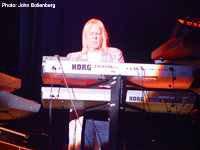 ), Jon Anderson and Rick Wakeman. 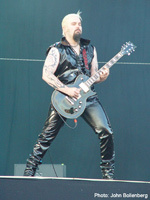 Queensrÿche were not at all interested, and just ate their dinner as Wakeman jumped up when Lampard scored for Britain. Going to the toilet looks like a dangerous thing to do because, whilst Rick popped out for a mere five minutes, the Brits were awarded a penalty kick, which was missed by David Beckham (or saved by Barthez, if you like!). Rick couldn't believe what he missed when I told him. 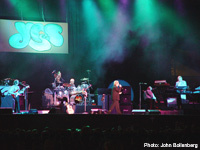 With the score still being 0-1 five minutes before the end of the game, all of Yes were driven to the main stage, as they were the headliners of this second edition of the Arrow Rock Festival. 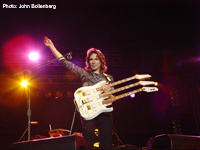 I escorted Steve Vai to the photo pit so he could witness a couple of Yes classics from the front of the stage. Yes' sound balance was brillant, adding, amongst others, "Owner Of A Lonely Heart" to their set, for sure a big rock classic, but one Steve Howe isn't very keen to play. 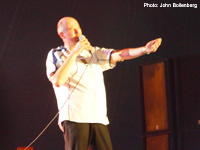 During the Yes set, keyboard tech Stuart Sawney had written a small note for Rick that read: "France 2 - England 1." Rick thought it was a joke, but as the Yes set evolved, he knew that Stuart hadn't been joking! Even if at a first glance some bands on Sunday 13th June looked a bit strange, looking back, every single one of them delivered their goods as well as could expected in front of an interested audience. Only Robert Fripp's soundscapes were not the kind of music the fans expected, but then again maybe these sounds fare better inside a hall than in an open air setting. However, it proved that thousands and thousands of music fans are interested to come and see what is mainly a prog festival. So I do hope the organisers will decide there will be a third edition of the festival, and if they need a helping hand putting together the "prog day," then I'm more than willing to help them out! Arrow Rock Festival: thanks and we'll be back next year!